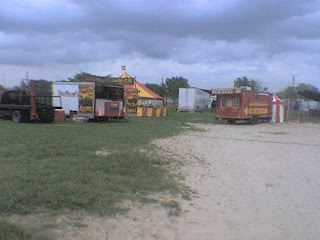 Five photos of this years edition of Lewis & Clark Circus owned by Bob Childress. These were taken this morning in Bennettsville, SC. This is the front of the midway. The Petting Zoo and Pony Sweep are all under the same top. 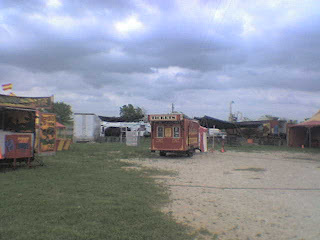 The Pit Show in the back end with a 14' Burmese Python and the front end carries all the livestock for the Petting Zoo and PonyRide. This is the Main Entrance trailer. 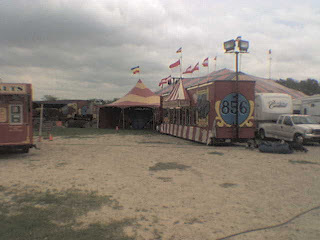 The ticket booth is at one end, the pass through to the Big Top, ( a hip roof push pole with one 40 foot center ) and concessions in the other end. The three tigers were just started in the training process about 5 weeks ago by this old fat used to be tiger trainer, Bob Cline. While I'm not travelling with the show, I've worked with them several times in between being employed and living 3 1/2 hours away. Bob Childress has been working them by following my example. 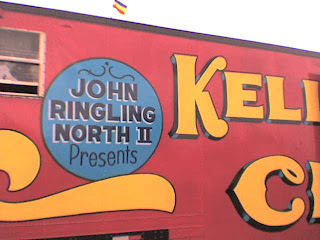 Gang, this is a fine small show, that offers a great family circus with a big and little act, a camel routine, Bill Brickle as Ringmaster and dog trainer and others. They packed them in at Lancaster last night. I can only hope for grassy lots and good crowds for them. If anyone has ever met Bob Childress, you know this is a fine outfit. With the purchase of a working man's bunkhouse this spring, the show is travelling on 6 show owned units and the performers privately owned trailer rigs. Bill, This picture was taken in 1952 on the Beatty Show. Kind of faded. On the back I had written Anna Mae, (Trainers) Lucky Smith and Charles "Hilo" Mayo. Ether on yours or Buckles blog I read that Anna Mae was on a different show that year. So is this the same Anna Mae. Somewhere I have other pictures I just haven't found them yet. 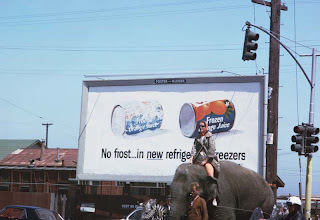 This is the "Anna May" that our elephant was named after and she was indeed with the Beatty Show in 1952. No idea who these guys are but they look like beginners. You may notice that "Anna May" is wearing the howdah for the riding tiger and I can't tell if that is a fence behind them or the chute for the cats. Roger or Dave might know. You are right, this is the animal walk and shows "Targa" carrying a local "celebrity". For some reason Hugo always had this group follow slightly behind the rest of the herd. No idea who the man is but the zebra's name was "Pasha". RBBB last night entertained thousands of families with FREE TICKETS in a massive rollout of free Opening Night publicity for their New York City premiere at Madison Square Garden. The ticket distribution was handled by the Salvation Army. Too bad the press release didn't mention that the NEW PRICE of Cotton Candy is $12.00, up from $10.00, starting Opening Night when the economically depressed Salvation Army families were invited to attend the circus courtesy of Ringling. Out of a clear blue sky my wife dropped two folders of pictures on my desk, mostly family stuff including this little gem. This is the Tony Diano Animal Show with the World of Mirth Shows in 1954 with Barbara standing on "Tommy's" tusks. Elephants from L to R "Betty", "Katie", "Tusko", "Mysore", "Calcutta" and "Tommy". Standing in the doorway are "Nackatala" and "Uganda". Rex Williams managed to keep out of the picture, their son Ben was just over a year old at the time (not Benny, not Benjamin) named after Rex's oldest brother, definately not Ben Davenport. 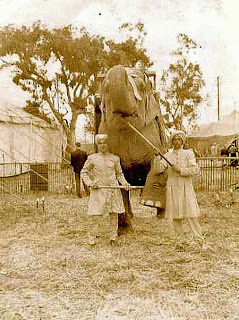 Ben and Barbara with the Howard Suesz elephants "Mary", "Ruth" and "Sue" (Clyde Bros.Circus) at LaCrosse, Wis, in 1959. This is the first pyramid of this type done in America. Rex told me that a Circus Fan was showing movies of European circuses when he saw this trick and added it to the act. Again Rex must have spotted the camera but Eddie Akins can be seen in the background. Ben and "Anna May" 1960. Ben, Barbara and "Anna May" with Gran Circo London in Mexico City 1973. Ben riding "Turk" at the Ringling Circus Park 1974. 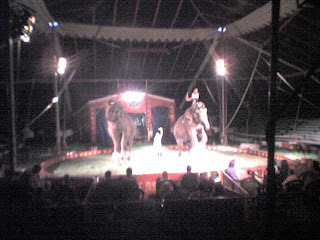 Former Billy Smart elephants "Carmen", "Mudu", "Rebecca", "Zina" and "Gilda". Ben and Mickey McDowell with Eddie Zacchini Circus 1981. Ben and Debbie Chapman at Medinah Temple 1982. Ben and Karen Lowande with Royal Hanneford. 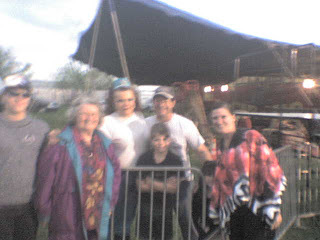 Ben with wife Darlene and daughters Stormy and Skye. Presenting "Ned", "Anna May" and "Amy". No one but few are aware that the bonds he speaks of are not the same as insurance. 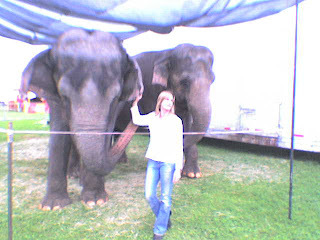 To date I know of no bonding agent for wild animals in florida or across the USA. If this bond passes then 85 percent or more of all florida class 1 dangerous animals will be forced to close. 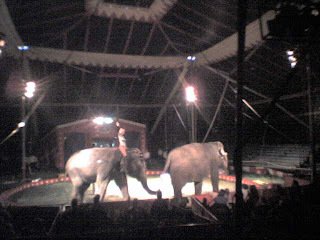 Know of any circus trainers with extra 10,000 to write a bond to florida fish and game. Better get the word out before it passes! "Not many, in the future if you let me take the pictures and I'll let you identify the Barnum & Bailey parade wagons." I have tried a few times to comment and the blog says to report a problem? Anyway I was going to ID the folks in the photo. Bottom right is Denise (Zoppe) across from her is her mom. In the back is Laura Herriott and Doug Terranova. I didn't know Frank married Gail. She worked at Great Adventure in NJ with me years ago.